Signals emanating from receptors of the tumor necrosis factor/nerve growth factor (TNF/NGF) family control practically all aspects of immune defense and, as such, constitute potential targets for therapeutic intervention through rational drug design. Indeed, arrest of these signals by blocking ligand–receptor interactions enables effective suppression of a variety of activities that are implicated in various pathologies, such as T and B lymphocyte activation and growth, inflammation, fibroblast proliferation, and cell death. To be therapeutically useful, however, inhibition of signaling should be restricted by determinants of specificity, at least to the same degree observed when blocking activation of individual receptors. In spite of their broad range of functions, receptors of the TNF/NGF family are known to activate just a few signaling pathways. Of these, the most extensively studied are the activation of the caspase protease cascade, which leads to cell death, and the activation of NF-κB (nuclear factor-κB) transcription factors through protein phosphorylation cascades. Until recently, most studies of the two pathways have solely focused on the core signaling complexes that are shared by the different receptors: death-inducing complexes containing the cysteine proteases caspase-8 and caspase-10, bound to the adapter protein MORT1/FADD (mediator of receptor-induced toxicity/Fas-associated DD protein), and the NF-κB-activating complex, composed of the protein kinases IKK1 (IκB kinase 1) and IKK2 (IκB kinase 2) and the regulatory subunit NEMO (NF-κB essential modulator; the 'IKK signalosome'). Knowledge has begun to emerge of additional molecules and mechanisms that affect these basic signaling complexes and impose specificity on their function. The tumor necrosis factor (TNF) ligand and TNF/nerve growth factor (NGF) receptor families provide a unique point of view of biological regulation. (For a list of alternative names of receptors and ligands, see website . See Fig. 1 for a schematic presentation of the known interactions between them.) These receptors and ligands are expressed in almost all cells and trigger a wide range of different, in part contrasting, cellular activities [2–5]. They help to regulate practically every aspect of immune defense, as well as certain developmental processes. All of these activities are mediated by a unique set of apparently few signaling proteins, which are shared by the different receptors . Schematic drawing of the known interactions between members of the TNF ligand family and members of the TNF/NGF receptor families. Death domains are indicated as black boxes (or gray boxes, in the cases of NGF-R and EDAR). EDAR, ectodysplasin-A receptor; NGF, nerve growth factor; NGF-R, receptor for nerve growth factor; TNF, tumor necrosis factor. Understanding how such a heterogeneous group of functions can be elicited by a limited number of signaling proteins and, just as importantly, how the signaling system 'decides' which of its potential downstream pathways will be activated in a given situation is not solely a matter of academic interest. As demonstrated by the efficacy of anti-TNF therapy in diseases such as rheumatoid arthritis , understanding the mechanisms of action of the TNF/NGF receptor family at the molecular level bears immense therapeutic potential. Studies in our laboratory have helped to elucidate two aspects of specificity in the functioning of the signaling pathways: mechanisms that determine whether cell death or a noncytocidal effect is induced, and mechanisms that impose specificity of action on the enzymes that activate the highly pleiotropic nuclear factor-κB (NF-κB) transcription factors. Several members of the TNF/NGF receptor family are capable of inducing cell death. Those doing so most effectively, collectively known as 'death receptors,' share an intracellular motif, the so-called 'death domain,' through which their cytotoxic activities are mediated. Much of our current understanding of their mode of toxicity arises out of studies of the earliest-known members of the TNF ligand family, TNF itself and lymphotoxin-α . Almost from the first, it was noted that the ability of these cytokines to kill cells is independent of protein synthesis, but, rather, is strongly potentiated by inhibitors of protein synthesis [8–10]. Once it became evident that this cytotoxicity is receptor mediated , it followed that the cytocidal effect is exerted by activation of death-inducing signaling proteins that pre-exist in the living cell. It also followed that there exist in cells protein-synthesis-dependent 'antideath' functions. One could further deduce from these early studies of TNF cytotoxicity that the protein-synthesis-dependent 'anti-death' functions are in part activated by TNF itself . Current knowledge of the molecular mechanisms of cell death induction by the death receptors enables delineation of a continuous pathway that begins with the triggering of receptor signaling by ligands and ends with certain specific morphological and functional manifestations of programmed cell death. Acting on the assumption that the apoptotic mechanism activated by the death receptors involves solely cellular components that have pre-existed in the cell before death is triggered, attempts to identify these components have centered on analyses of the protein–protein interactions initiated by the stimulated receptors. Two-hybrid screens led firstly to the identification of three adapter proteins, MORT1/FADD [13, 14], TRADD , and RIP , all of which contain death domains that bind to the death domains in the receptors. Subsequent two-hybrid screens and analysis of the composition of the signaling complex associated with the death receptor Fas led to the identification of caspase-8 (MACH/FLICE [MORT1-associated CED3 homologue/FADD-like interleukin-1-converting enzyme]), a cysteine protease that is recruited to the receptor complex through its binding to MORT1/ FADD and, once activated there, initiates the cell death process [17, 18]. A close homologue of caspase-8, caspase-10, is similarly recruited and also serves to initiate the apoptotic process [19–21]. 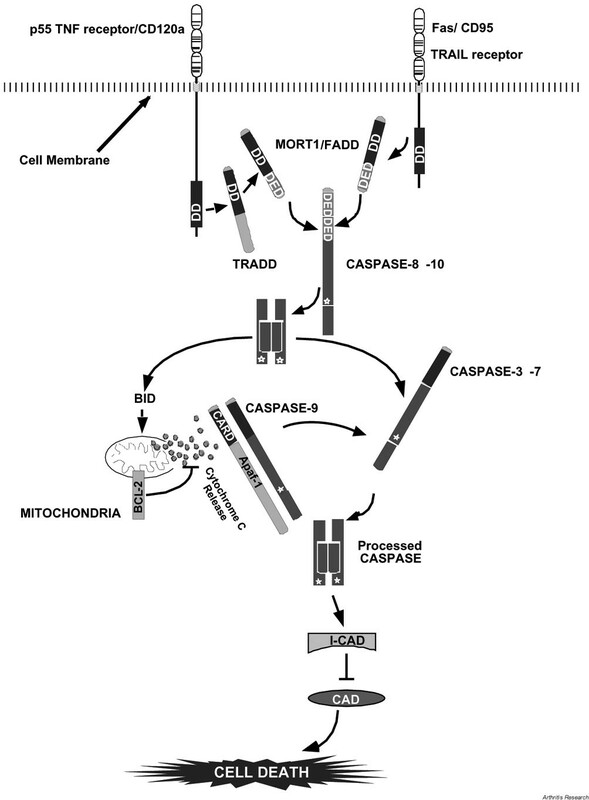 Once activated, caspase-8 and caspase-10 activate other members of the caspase family, the so-called 'executioner caspases' such as caspase-3 and caspase-7, either by direct proteolytic processing of their precursors or indirectly, by triggering the release of cytochrome c from the mitochondria: cytochrome c activates caspase-9, which in turn processes and activates caspase-3 and caspase-7. The 'executioner' caspases cleave target proteins that play critical roles in specific aspects of the death pathway. Two such examples are the processing of I-CAD/DFF-45 (inhibitor of caspase-activated deoxy-ribonuclease/45-kDa subunit of DNA fragmentation factor) that leads to DNA degradation  and the cleavage products of gelsoline, which participate in the process of membrane blebbing . The straightforward nature of the aforementioned pathway (Fig. 2) highlights the need to clarify its regulation. If all that it takes for the death receptor to trigger cell death is just a short series of molecular interactions leading from receptor activation to the eventual death events, how is it that these same receptors so often elicit effects that are not at all cytotoxic, and may even stimulate cell growth? Schematic drawing of the caspase pathway leading to cell death induction by members of the TNF receptor family. DD, death domain; DED, death-effector domain; TNF, tumor necrosis factor. For other abbreviations, see Glossary of terms. Knowledge emerging from the many laboratories that have addressed this question implies that the 'decision' taken by the death receptors either to induce cell death or to exert noncytocidal effects is actually a summing up of multiple 'antideath' mechanisms that act at various mechanistic levels . Some of the mechanisms that prevent the induction of cell death do so by arresting the recruitment of the death-signaling proteins, thus enabling the receptors to trigger other signaling molecules specifically involved in noncytocidalfunctions. Quite interestingly, however, protective mechanisms that act by harnessing the same molecules that are dedicated to the induction of cell death to noncytocidal functions also seem to exist. Studies of the impact of targeted disruption of the genes encoding caspase-8 and its adapter protein, MORT1/FADD, revealed that apart from signaling for cell death, these same proteins also participate in the processes triggering development of the heart muscle in mammalian embryos and, at least in the case of MORT1/FADD, triggering lymphocytic growth as well [25–27]. Knowledge of the mechanisms that direct these death molecules to noncytocidal functions is just beginning to emerge. One of the proteins shown to participate in this regulation is the enzymatically inactive caspase homologue cFLIP. Several studies indicate that this protein is recruited to the death receptors through MORT1/FADD, where it not only blocks the activation of caspases, but also, perhaps in conjunction with caspase-8, recruits additional signaling proteins (e.g. ). Very recently, a caspase-8-binding protein called CARY (caspase-8 binding protein with RNA-binding motifs) that also seems to contribute to this regulation was discovered in our laboratory. We propose that this protein acts at a postreceptor level to regulate the activation of caspase-8 in the cytosol. 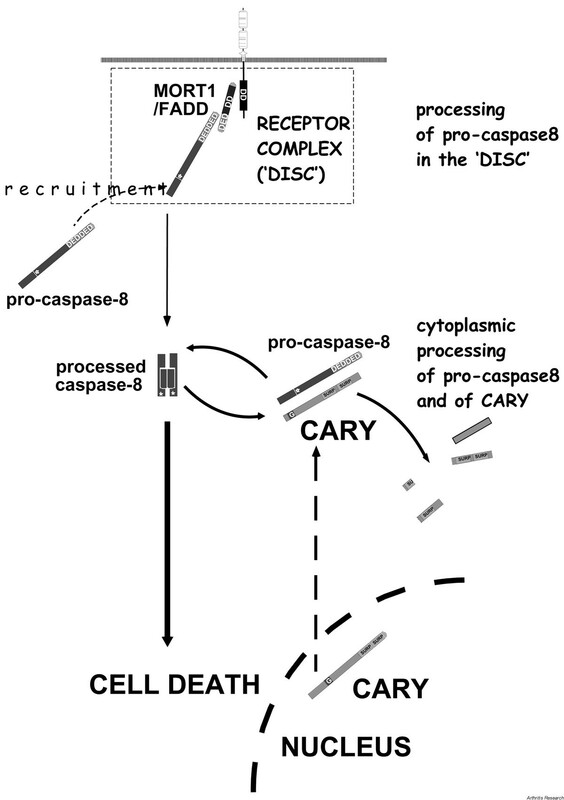 Because CARY itself is cleaved by caspase-8, its impact on the apoptotic process is transient. Modulations of the level of CARY in the cytoplasm, either by its release from the nucleus, where large amounts of this protein are stored, or by phosphorylation of its caspase-8-mediated cleavage site, probably contribute to variations in the levels of active caspase molecules in the cell, which may well be a critical factor in determining whether or not the effects of caspase activity result in cell death (Fig. 3) (Goncharov MT et al., manuscript in preparation). A hypothetical model describing the proposed role of CARY (caspase-8 binding protein with RNA-binding motifs) in controlling postreceptor cleavage of pro-caspase-8. For abbreviations, see Glossary of terms. As mentioned above, it was evident from the earliest studies of cell death induction by TNF that while the death mechanism itself is independent of protein synthesis, the vulnerability of cells to TNF cytotoxicity is regulated by protein synthesis mechanisms and that the activities of at least some of the proteins protecting cells from TNF cytotoxicity are induced by TNF itself. A major advance towards understanding this regulatory process was the identification of the NF-κB transcription factor family as involved in the induction of cellular self-resistance to TNF cytotoxicity. The NF-κB transcription factors are known to be activated by almost all of the members of the TNF/NGF receptor family. Suppressing the activity of these transcription factors greatly sensitizes cells to the cytotoxic effects of TNF and various other agents (reviewed in ). Indeed, the genes for several of the proteins known to play a role in regulating the cytotoxic effects of members of the TNF/NGF family are regulated by NF-κB (e.g. ). An additional major challenge to our understanding of the nature of specificity in the signaling mechanisms of the TNF/NGF family of receptors is posed by the way they activate NF-κB. The core mechanism that activates NF-κB was recently elucidated and was found to consist of a macromolecular complex known as the IKK signalosome . This complex is composed of two protein kinases, IKK1 and IKK2. Both kinases phosphorylate IκB (inhibitor of κB), an NF-κB inhibitory molecule, at specific sites, thus targeting it for ubiquitinilation and consequent proteasomal degradation. Almost all of the receptors of the TNF/NGF family are able to activate NF-κB and involve this activation in a significant part of their gene regulatory effects, influencing a broad spectrum of cellular functions, only some of which concern cell death. Some of the NF-κB-regulated functions contribute to innate immunity and others to adaptive immunity; still others affect certain aspects of embryonic development. In every case, however, NF-κB activation by the receptors was found to be mediated by the same basic NF-κB-activating mechanism, the IKK signalosome. Knowledge of the ways in which specificity is imposed on this core mechanism is only now beginning to emerge. Studies carried out mainly in the laboratory of David Goeddel have demonstrated involvement of two adapter proteins, TRAF2 and RIP, in the activation of NF-κB by TNF. TRAF2 is a member of a family of adapter proteins that shares among its members a C-terminal protein-binding motif, the TRAF domain . Other members of the TRAF family are also known to participate in NF-κB activation by members of the TNF/NGF receptor family, as well as by some other receptors . RIP is a death-domain-containing adapter protein that is recruited to the p55 TNF receptor by the binding of RIP to TRADD, another death-domain-containing protein, directly associated with this receptor [34, 35]. Our own attempts to contribute to the understanding of specificity in NF-κB activation have focused on exploring the identity of the signaling proteins acting downstream of these adapter proteins. By means of two-hybrid screens, we succeeded in identifying several novel proteins that bind to TRAF2 and, when overexpressed, modulate NF-κB activation, suggesting that they participate in the activation of NF-κB or in its regulation. One of the novel TRAF2-binding proteins, a protein kinase that we called NIK (NF-κB-inducing kinase) causes dramatic activation of NF-κB when overexpressed. On the other hand, over-expression of kinase-deficient mutants of this enzyme was found to block the activation of NF-κB by a variety of different inducers . This indiscriminate inhibition implies that NIK is intimately associated with the core mechanism of NF-κB activation. Indeed, subsequent studies revealed that NIK binds directly to IKK1 and phosphorylates it . Although there are still large gaps in our understanding of NIK function, the evidence that is accumulating indicates that this kinase possesses the ability to activate NF-κB in response to specific inducers and for specific purposes. Even though both the p55 TNF receptor and the lymphotoxin-β receptor involve TRAF2 in NF-κB activation, NIK is apparently activated only by the latter [38, 39]. Stimulation of the IKK signalosome by TNF leads to the activation of an NF-κB complex comprising the NF-κB subunits p65 (RelA) and p50, and of IκB, through phosphorylation of IκB induced by IKK2 (and consequent degradation of IκB). However, stimulation of the IKK signalosome by NIK also leads to the formation of another NF-κB subspecies, p52, through induced phosphorylation of a p52 precursor, p100 (NF-κB2) by IKK1 (and consequent proteolytic processing of p100) (Fig. 4) [40, 41]. 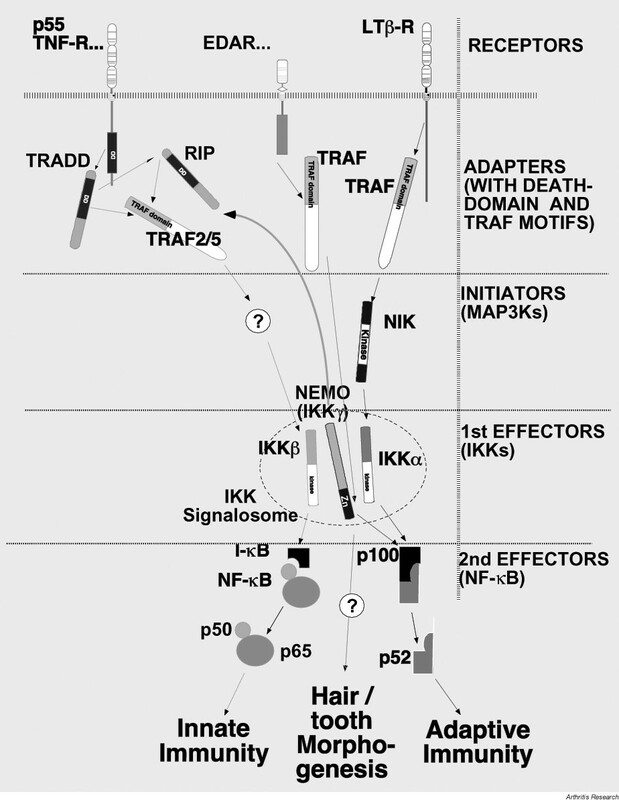 A model depicting the nuclear-factor-κB-activating pathways described in this essay. For abbreviations, see Glossary of terms. It is not yet known which additional inducers other than lymphotoxin-β involve NIK in their effect on NF-κB. However, the phenotypes of mice with a natural point mutation in NIK (the aly strain) and of mice with targeted disruption of the NIK gene indicate that NIK specifically mediates the effects of NF-κB-inducing agents that serve to regulate adaptive immunity [39, 42]. Among the proteins found in our two-hybrid screens to bind to the other NF-κB activating adapter protein, RIP, we focused on one, which we have initially called RAP2 (the second RIP-associated-protein found in our screens). Unlike NIK, RAP-2 was found to be devoid of any enzymatic function. Nevertheless, it dramatically modulated NF-κB activation. At low expression levels, it somewhat potentiated the activation of NF-κB by a variety of agents, while at higher expression levels, it strongly inhibited such activation. This same protein was independently identified in several other laboratories, where it has been called NEMO, IKKγ, IKKAP1, and FIP3 [43–46]. Studies coming out of these laboratories revealed that NEMO also binds to the two protein kinases comprising the IKK signalosome, and in fact constitutes an integral part of this macromolecular complex. The coincidental identification of NEMO through its binding to RIP and to the IKKs suggested that this protein may function as a molecular link between the IKK signalosome and specific inducers. Indeed, in further analysis we found that NEMO is recruited to the TNF receptor complexes along with the other signalosome components . It was later determined that a RIP homologue, RIP2/RICK, also binds to NEMO and recruits the signalosome to a RICK-activating intracellular receptor molecule, Nod1 . 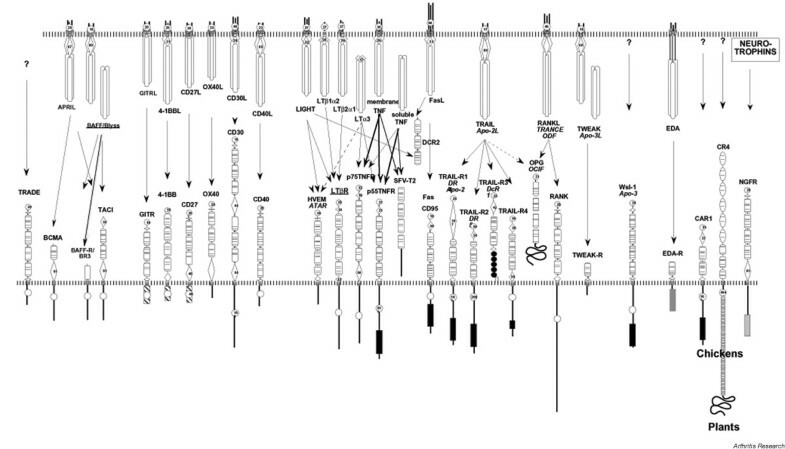 Certain viral proteins have also been shown to regulate the signalo-some function by binding to NEMO [46, 49]. A more recent development in the study of NEMO function was the interesting finding that the C-terminal region of this protein, which is comprised of a zinc finger domain, is specifically involved in NF-κB activation by only some of the TNF receptor family members. In both mice and man, mutations in this region result in developmental deficiencies concerning the morphogenesis of hair, sweat glands, and teeth that strongly resemble the deficiencies observed when EDAR, a member of the TNF/NGF receptor family, or its ligand is mutated. Such mutations also result in a hyper-IgM syndrome, similar to that observed when the CD40 ligand is mutated. However, they seem to have little effect on NF-κB activation by TNF or bacterial lipopolysaccharide [50, 51]. By means of two-hybrid screens, we recently identified several proteins that specifically bind to the C-terminal region in NEMO and may participate in the differential response to NF-κB inducers mediated through this region. It is gradually becoming evident that the activation of NF-κB is much more complex than was originally perceived soon after the discovery of the two kinases comprising the IKK signalosome. It is now known that NF-κB activation involves several different molecular events in both the cytosol and the nucleus and is affected by multiple regulators. Though our knowledge of these mechanisms is still fragmentary, one important implication of our current understanding is that, although the same core molecular complex, the IKK signalosome, participates in the activation of NF-κB by a variety of different inducers, this core complex displays sufficient complexity of interaction to allow for specificity of regulation. With some regret, we are watching the gradual replacement of the simple and elegant initial models of signaling mechanisms for cell death and NF-κB activation by members of the TNF/NGF receptor family with models of much greater complexity. This loss of elegance is surely worthwhile, as the new, more complex models further our understanding of the ways in which the simple set of signaling molecules known to be activated by members of the TNF/NGF receptor family can coordinate the broad and heterogeneous range of activities controlled by these receptors, without apparent self-contradiction. In essence, we are gradually learning that this simple set of signaling molecules constitutes only the framework within which a much more complex set of molecules interacts, imposing specificity on its action. There is also an obvious applicative value to this emerging complexity. Understanding the workings of biological regulation at the molecular level provides us with potential tools for medical manipulation of pathological deregulation. It was the search for molecules that provide self-resistance to TNF cytotoxicity that led researchers in our laboratory and several others to the discovery, more than a decade ago, of soluble TNF receptors in body fluids [52–55]. This finding paved the way toward the current use of engineered soluble TNF receptors to block TNF function in diseases, such as rheumatoid arthritis, in which TNF is a causative factor. One can just as well expect that identification of regulatory molecules that impose specificity on the function of TNF/NGF receptors will lead to more refined disease therapies designed to specifically block the deleterious effects of these receptors, without obliterating the beneficial ones. CARY = caspase-8-binding protein with RNA-binding motifs; DFF-45 = 45-kDa subunit of DNA fragmentation factor; FADD = Fas-associated death-domain protein; FIP3 = 14.7-K interacting protein 3; FLICE = FADD-like inteleukin-1-converting enzyme; I-CAD = inhibitor of caspase-activated deoxyribonuclease; IKK = IκB kinase; IKKAP1 = IκB kinase-associated protein 1; MACH = MORT1-associated CED3 homologue; MORT = mediator of receptor-induced toxicity; NEMO = NF-κB essential modulator; NIK = NF-κB-inducing kinase; RAP2 = RIP-associated protein; RICK = RIP-like interacting CLARP kinase; RIP = receptor-interacting protein; TRADD = TNF-receptor-1-associated death-domain protein; TRAF = TNF-receptor-associated factor. DW was supported in part by grants from Inter-Lab Ltd, Nes Ziona, Israel; Ares Trading SA, Switzerland; the European Commission Grant; the Joseph and Bessie Feinberg Foundation; and the German–Israeli Project Cooperation (DIP).